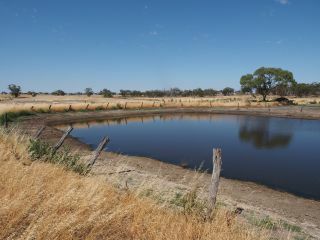 Environmental water was delivered to 40 of the 51 Wimmera-Mallee wetlands in 2015–16, providing refuge for plants and animals during one of the driest years on record. Environmental watering created pockets of water across a very dry landscape, improving conditions for native plants and animals including lace monitors, straw-necked ibis, kangaroos and a range of waterbirds. Environmental watering in wetlands in the Wimmera region provided much-needed refuge for some baby wood ducks at Pinedale and a fledging wedge-tail eagle at Harcoans. In the Mallee, Greens Wetland, Barbers Swamp and Rickard Glenys Dam provided vital watering holes for local wildlife, attracting an extraordinary number of birds, reptiles and mammals. In 2015–16, some of the Wimmera-Mallee wetlands were investigated as potential surrogate refuge sites for the endangered Murray hardyhead. Surrogate refuge sites are sites with a secure water source that don't have any hardyhead predators. They are used as breeding locations to provide a range of source populations for the larger Murray hardyhead sites. They are usually small sites, which means that the fish can be easily caught for translocation into larger sites. The investigation was part of a larger Murray hardyhead recovery project funded by the Victorian Government's Threatened Species Protection Initiative. Many of the Wimmera-Mallee wetlands are on private land. Environmental water managers regularly meet landholders on-site to share knowledge about environmental water. Wimmera-Mallee wetlands are also in areas of Aboriginal cultural significance. The North Central Catchment Management Authority continues to work with the Barengi Gadjin Land Council which has a representative on the Wimmera-Mallee Environmental Watering Advisory Group. The group provides advice and feedback on environmental watering activities from a community perspective. The group participated in a field trip in 2015–16 to see first-hand the environmental benefits of watering at three wetlands in the region.